We are a 501(c)(3) affiliated with IGCA Rescue . Contributions benefit IGRF. If you prefer, you may also donate by mailingl a check to: IGRF-NW, P. O. Box 30644, Seattle, WA 98113-0644. We appreciate donations of any amount and can provide a tax receipt upon request. 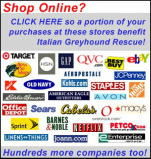 Shopping at the All Breed Store benefits the Italian Greyhound Health Fund. This fund pays for vetting for all rescued IGs across the USA. Purchase of these items benefits IG Rescue.